Quilting Links: A few sites for those seeking to learn more about quilting, particularly beginners. Most of these sites will lead to many more. Happy surfing... I mean... happy quilting! World Wide Quilting Page : Extensive information. The Quilt Channel : Guide to quilting links. Quilt University : Offers on-line classes. 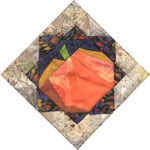 Quilt Woman.Com : A wealth of links to a wide variety of sites, including lots of quilt designers. QuiltNet : Links to shows, guilds, museums and more. Beginner's Resource Page : From Planet Patchwork. 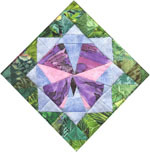 Quilter's Cache : Good resource for lessons, patterns, and tips. Skydyes : Mickey Lawler painted the sky fabric for Whistling, then did a couple more pieces for Winter Lights. Christine Thresh's Paper Piecing Primer: Simple pattern and instructions to print and sew.